Despite being the oldest established champagne house (founded in 1729), Ruinart is one of the least well-known of the big-name brands in the region. Whether that’s a symptom of being over-shadowed by its stablemates in the Moët Hennessy group (Krug, Moët & Chandon and Veuve Clicquot), or a result of its comparably lower production volume, we’ve always admired the impeccable fruit and purity of Ruinart’s Chardonnay-dominant style and long-believed the house deserves more recognition. And slowly but surely, it’s beginning to get it. 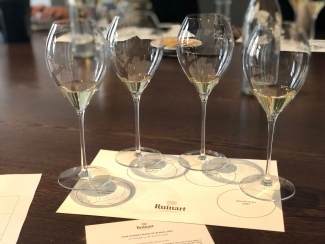 Indeed, it was at the Moët Hennessy offices in London last week that we tasted the latest addition to the Ruinart range: Dom Ruinart Blanc de Blancs 2007. In the UK to launch the new vintage was the brilliant young winemaker, Caroline Fiot. 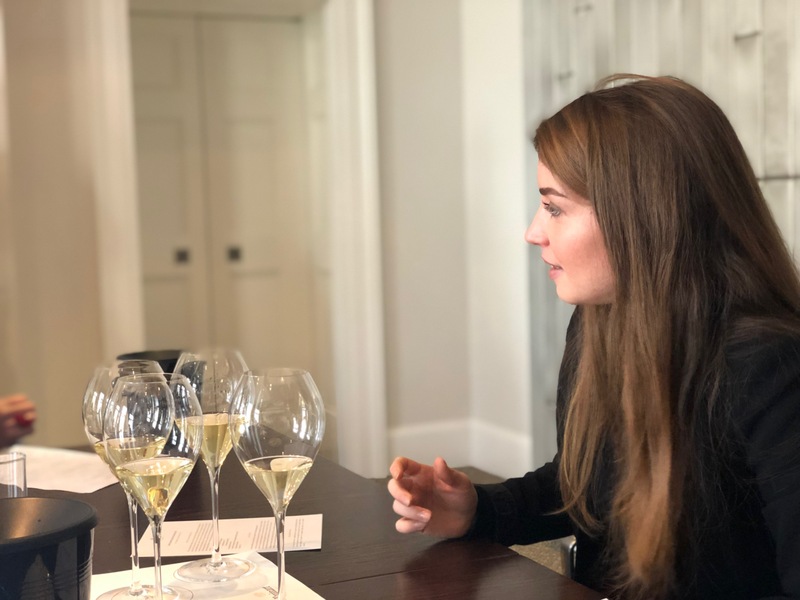 One of three female winemakers at the house – a significant number in this still predominantly male industry – Fiot has been at Ruinart for just over 3 years, and was quick to highlight how remarkable the recent harvests have been. “2018 was a striking vintage for quantity and quality,” she told us. “We started on 20th August, one of the earliest this century.” Although 2003, 2007 and 2017 also began in August, Fiot cited 1893 as one of the last vintages prior to the 21st century to commence this early. Fiot went on to describe harvest 2018 as “an intense three weeks” but clearly believes there is great potential: “We had good balance of ripeness, clean fruit and total acidity was great.” Unsurprisingly, the team have already decided to make both a Dom Ruinart Blanc de Blancs 2018 and a Dom Ruinart Rosé 2018. 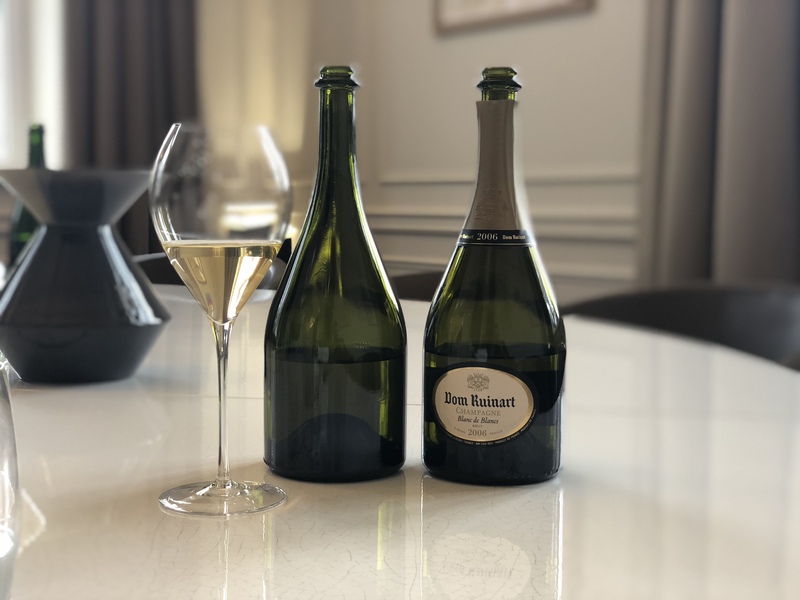 Before tasting the new Dom Ruinart Blanc de Blancs 2007, we began by familiarising our palates with the house style, tasting both a bottle and magnum of Blanc de Blancs NV. The main characteristics that Fiot and the winemaking team are striving for with their non-vintage are: aromatic strength and freshness; fresh citrus and tropical pineapple with some floral character; a reductive style – Ruinart always minimise O2, using stainless steel tanks and controlled temperature during fermentation; roundness – they also always do full malolactic fermentation as they want the resultant roundness and a slightly savoury finish; and, lastly, for it to be easily accessible. Bright fresh lemons and lots of tropical notes; pineapple leaps out. Some lees character comes through on the palate. White peach and hints of jasmine, acacia and ginger on the finish. Balance of freshness and dosage seems spot on. Seems a little more reductive, has good preservation of aromatics and a more oily texture. Packed full of lees character producing a great mouth experience. Lots of ripe lemons, pineapple and dried fruits. The higher dosage seems very flattering and adds some nice roundness to the palate. Great finish: light and fresh with a hint of salinity. There are three distinctions between the bottle and magnum: base year (2015 vs 2014); lees ageing (1 year longer for the magnums); and dosage (currently 1 g/l less for bottles). Dosage has been decreasing at many houses in recent years and will continue to do so further, as much to do with climate as anything else, according to Fiot. As global warming takes effect, the fruits are reaching higher levels of ripeness, so the winemakers do not need to use as much dosage. Furthermore, in order to increase the sustainability of their vineyard management, Ruinart have hiked up their use of cover crops (the planting of crops between and under the rows of vines). These cover crops take nitrogen away from the vines and give more life to the soil, preventing the need for herbicide use. 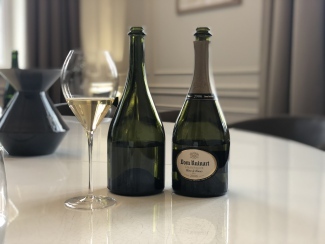 Moving onto the prestige cuvée range, we tasted new Dom Ruinart Blanc de Blancs 2007 – the 25th vintage of Dom Ruinart (the first was Dom Ruinart 1959) – alongside the previous vintage, Dom Ruinart Blanc de Blancs 2006. Ripe peaches and creamy character with dusty chalk. Richness and ripeness comes out on the palate. The lees character really comes forward and has a slight faulty, dry mid-palate and bitter end, but can still see the fruit. Has a rich and oily texture that seems quite full, perhaps giving it an unusually hearty finish. Nice, clean and precise with a hint of flint character and some reductiveness. Lots of ripe lemons, peaches and bundles of lees character. Has a light and fresh texture with a good balance of fruit. Some dried apricots and lemons really come out with a great mouthfeel from the lees ageing. Has a lightness and delicacy and very precise feel, this is good. The 2007 vintage was one of the earliest harvests of the century, commencing in August. The growing season started warm and sunny with some rain and humidity creeping in around July. The Côte des Blancs provided a 63% majority of the grapes, with the remaining 37% coming from the Montagne de Reims. Some of the most predominant villages in the blend are therefore the southern Grand Cru sites: Chouilly, Le Mesnil and Verzenay. We were surprised by just how far the champagne has come since we tasted it with Chef de Cave Frédéric Panaïotis last year. Packed full of clean and pure fruit, it has a light and fresh texture that gets better and better with time in the glass. This is a real masterpiece from a difficult vintage that is bound to improve with more post-disgorgement ageing. Definitely one to watch unravel over the years. Looking to the future, there will be no Dom Ruinart Blanc de Blancs 2008. Although a stunning vintage, it was slightly more Pinot Noir dominant, so not as suited to the Dom Ruinart style. It is likely though, that there will be both a 2009 and 2010 release. Interestingly, from the 2010 vintage onwards, all Dom Ruinart vintages will be kept on cork with an agrafe closure (a traditional agrafe closure is essentially a large metal clip used to secure the cork during second fermentation). So there will be some style changes, as the champagne will be interacting with cork, rather than a metal closure, whilst in the cellars. Mechanical disgorgement is also being dropped for the prestige cuvée, which, from 2010 onwards, will be disgorged by hand. Despite their relative lack of fame – or perhaps even because of it – Ruinart are becoming more and more progressive in the 21st century. Whilst having a number of female winemakers shouldn’t be seen as innovative today, it is unfortunately still uncommon. Alongside their developments in the vineyard and cellars, they are also leading the charge on preventing lightstrike (their non-vintage cuvée is particularly susceptible with its clear-glass bottle). Although white LED lights will damage the wine (it is apparently vitamin B2/riboflavin that is so sensitive), it has been shown that monochromatic LED lights in the orange spectrum will not (hence why sodium lights, which emit light in the orange spectrum, have been used in the past). Ruinart are therefore replacing their lights with orange LEDs.